Someone asked me in my class today what is my favorite food to eat on Thanksgiving. Honestly, I teach so many Thanksgiving classes in the month before the holiday that I am a little over all the food! I usually crave salad and roasted Brussels sprouts and a bite of pumpkin pie with a scoop of homemade ice cream. But I know that everyone else is so excited about the one-hit wonders of Thanksgiving like sweet potato casserole, turkey with cranberry sauce and cornbread stuffing. I truly only make stuffing only once a year and all my guests love it – so much so that I usually make two different types. 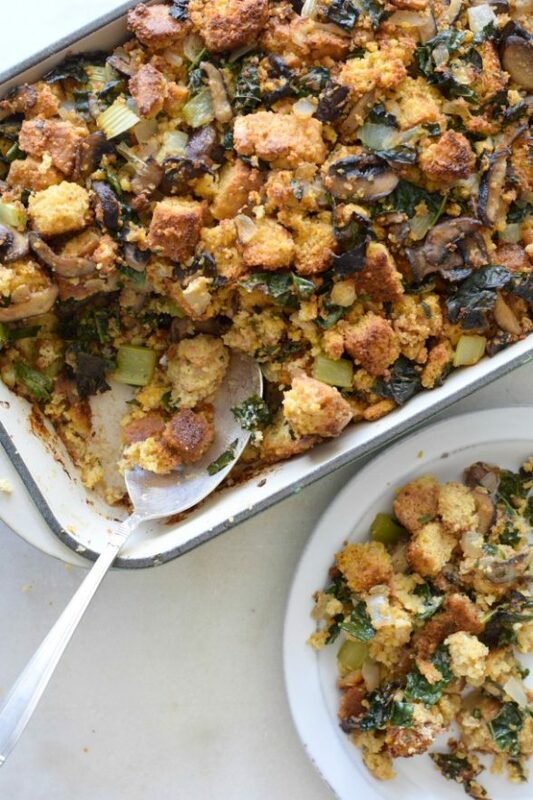 I taught this cornbread stuffing in last year’s Thanksgiving class and even though I’m not a huge fan of stuffing, I loved the variation on this with cornbread. 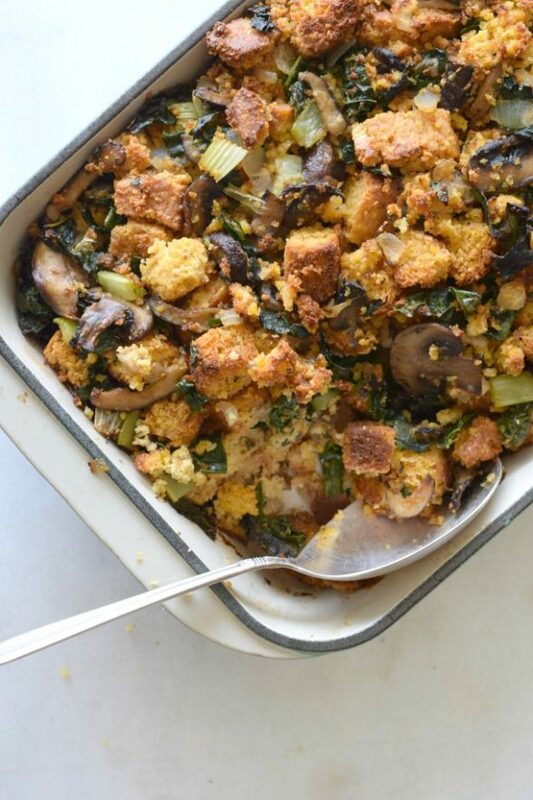 Because cornbread has a subtle sweetness to it, I wanted to balance it out with some big savory flavors like mushrooms and kale, a favorite combination of mine. And just as importantly, this whole dish goes perfectly with turkey! Your plan is listed in the recipe. Don’t be afraid to prep whatever you can ahead of time because that is the name of the game. I have frozen unbaked stuffing, defrosted it, and baked it and I swear you wouldn’t know it wasn’t prepared right before. Typically, I dry my bread out over the weekend before. (You can make your cornbread now and freeze it and then dry it out over the weekend.) I make my stock now and freeze it. I chop all the veggies next Tuesday and then assemble the cornbread stuffing on Wednesday, cover it and bake it on Thursday when the turkey is resting. Don’t forget to pull your casseroles out of the fridge a good hour or hour and a half before your put them in the oven so that they cook quickly and evenly. I am hoping to jump on Instagram live this afternoon to make stuffing and check in with you. I’m going to try for around 3:00 pm! Hope to see you then! Make the cornbread croutons: Preheat oven to 350 degrees. Cut cornbread into 1-inch and ½-inch cubes. You should have 10 cups. Spread bread over 2 large baking sheets and bake in upper and lower thirds of oven, stirring occasionally and switching position of pans halfway through baking, until completely dry, about 25 minutes. Transfer bread to a large bowl. Increase oven temperature to 450 degrees and grease a 13x9-inch baking dish. Heat olive oil in a large skillet over medium heat. 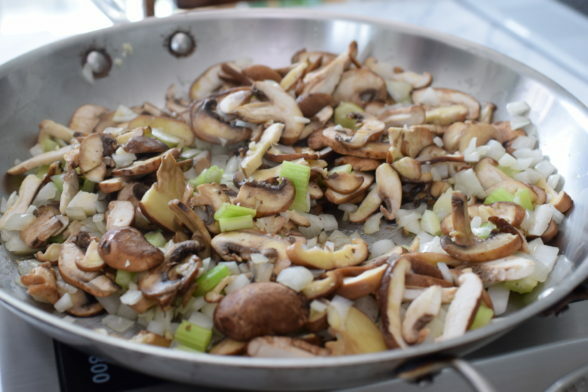 Add mushrooms, onion, celery, and garlic, and sauté, stirring occasionally until softened, 10 minutes. Stir in thyme, sage, smoked paprika, salt and pepper and stir until fragrant, about a minute. Add kale leaves and sauté until wilted, about 5 minutes. If pan is starting to get dry, add a couple Tablespoons of water or stock. Add vegetables to bread, tossing to combine. Pour stock and eggs over the bread mixture, tossing to coat evenly. Spread stuffing in the prepared baking dish, dot with butter and cover tightly with foil. Bake in upper third of oven until heated through, about 20 minutes. Remove foil and bake stuffing until top is browned, 10 – 15 minutes more. Stuffing can also be baked in a well-greased 12-cup muffin tin. Croutons can be prepared several days in advance. Vegetables can be chopped the day before. Entire casserole can be prepared up to the point of baking the day before and refrigerated or frozen and then thawed and baked according to the directions. 2. In a large bowl, whisk together the flour, cornmeal, baking powder, baking soda and salt. In a medium bowl or a blender, combine buttermilk, melted butter, eggs and honey until well blended. Pour wet ingredients into dry ingredients and stir until just combined. Stir in the corn kernels. Using an ice cream scooper, divide the batter into the muffin pan or pour it into the prepared pan. 3. Bake the muffins for 15-18 minutes, or until the tops are golden and a toothpick inserted in the center of a muffin comes out clean. Or bake the cornbread in the 8 x 8 pan for 30-35 minutes. Cool for 5 minutes on a wire rack before removing muffins from the pan. *If you like a more tender, less grainy cornbread, increase flour by ½ cup and decrease cornmeal by ½ cup. Stuffing is all done! Ready to bake tomorrow! If using non dairy milk for cornbread do you have a suggestion as to what works best? Soy, almond, etc? I have used unsweetened hemp milk and almond milk with success!